U.S. policymakers are scratching their heads and suggesting that we take shorter showers, but we need to get them talking about how eating meat is putting us deeper and deeper into this water crisis. What you can do right now is spread the word about the water footprint of animal agriculture and contact legislators and lawmakers to make sure they know that we want the correct information out there. California has been in a severe drought for the last four years, which means local governments have started rationing water for showers and sprinklers, and farmers have started drilling into our groundwater supply. Surveys show that 90 percent of Californians are concerned about conserving water, but they’re not given the big picture. Long showers and lawn sprinklers are not the reason we are in a water crisis. It’s easy to follow the flow of water. 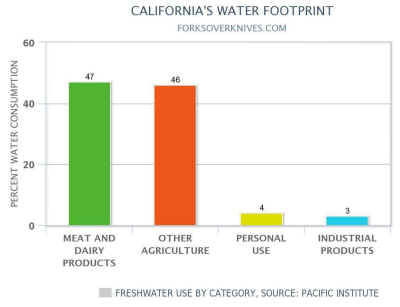 If we stopped eating animals, there would be no water crisis here in California. Growing feed crops for livestock takes up almost half of the water in California. Private homes use less than 5% of the water supply. It takes, on average, 2,500 gallons of water to produce just one pound of beef in the U.S. The average American eats over 200 pounds of meat every year. That means one hamburger takes about 650 gallons of water to create. Every year, drought-stricken California devotes 900,000 acres of its land to growing alfalfa to make hay, ninety-five percent of which is eaten by cattle (the other five percent by horses). Each one of these 900,000 alfalfa acres receives irrigation to the tune of 1 to 2 million gallons per year (50-80 acre inches per acre per year). Therefore, California uses 1.8 TRILLION gallons of freshwater to produce alfalfa hay for livestock each year. If California stopped growing alfalfa as livestock feed for just one year, that would leave enough water to sustain the human population of the city of San Francisco for the next 66 years. The largest importer of California hay for the past few years has been the United Arab Emirates, which is importing hay because it is concerned about the scarce water supply for its own citizens. Saudi Arabia will soon follow, essentially importing water from California via hay for its animals, which are then consumed by Saudi citizens. This virtual water trading loss will be a growing trend—certain countries depleting the natural resources of other, more unaware countries, such as the U.S., Brazil, and others, so they may “prosper” with importation of animals and animal products. Many scientists have stated that there will be a severe, international water shortage in fourteen to fifteen years. Here in America, we are draining ancient aquifers to grow feed crops for livestock raised locally and in other countries around the world. U.S. policymakers are scratching their heads and suggesting that we take shorter showers, but we need to get them talking about how eating meat is putting us deeper and deeper into this water crisis. What you can do right now is spread the word about the water footprint of animal agriculture and contact legislators and lawmakers to make sure they know that we want the correct information out there. Read more about this important issue at Freshwater Depletion: Realities of Choice. Editor’s Note: More and more people are turning to a plant-based lifestyle for their health and the environment. Try our spinach lasagna or lentil chili to see how eating this way is delicious and satisfying. Beef: The ”King” of the Big Water Footprints.” GRACE Communications Foundation. Web. 1 Apr. 2015. Footprint. Rep. Oakland: Pacific Institute, 2012. Print. Leithead, Alastair. “California Drought: Why Farmers Are ‘exporting Water’ to China.” BBC News. N.p., n.d. Web. 01 Apr. 2015. “The Hidden Water We Use – National Geographic.” National Geographic. Web. 2 Apr. 2015. Walker, Alissa. “Seriously, Stop Demonizing Almonds.” Gizmodo. Web. 8 Apr. 2015.